The breeze on your air, an off-beat trail, and the sense of adventure that comes with being on your own. Yes! That?s the thrill of mountain biking in Mongolia. This will be more amazing than anywhere you have ridden before. Experience Mongolia's remote wilderness and fascinating culture as you ride in this vast undiscovered land. 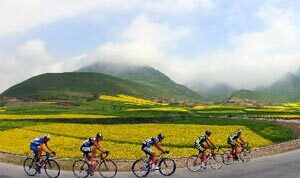 Bike Mongolia specialize in mountain biking and motorcycling adventure vacations because our staff themselves are experienced cyclists and enthusiastic riders. Our strong lightweight bikes have been chosen to suit Mongolia's tough off-road trails and we take care of your comfort, safety and all the details whilst you enjoy the trip of a lifetime in our unique country. Known as "the land of the blue sky", Mongolia is a remarkable, sunny country enjoying 250 sunny days a year. The vast expanses of the Steppes, the absolute magnitude, beauty and wonder of the Mongolian scenery are intertwined with the Mongolian nomadic life style and renowned hospitality which has changed little through the ages. By starting your journey on the edge of the ochre coloured Gobi desert you'll see the full spectrum of the landscape. From the Gobi's northern edge travel up into the Khangai Mountains to Karakorum, Genghis Khan's capital and one of the main cities along the Silk Road; from there you can visit his palace, part in ruins but parts are kept in good repair by local monks who have preserved art and other relics of the Mongolian empire including the 12 foot carved stone turtles which guard the perimeter. Travelling deeper into the mountains the countryside becomes more empty but the local people are very friendly and you can expect to be invited into people's houses for a drink and some cheese. Silk Road Group organizes challenging mountain biking tours across mountains, desert and open steppe. 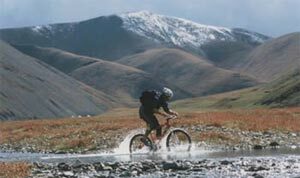 Mountain biking in Mongolia took off in the late 1990s and since then has become one of the best ways to explore this remote and beautiful land. On our mountain biking tours you will traverse the more mountainous areas of Mongolia, namely the Khangai mountain range lying at the Northern fringes of the Gobi desert. Meet the people of Genghis Khan who live in their felt tents and tend large flocks of sheep, goats, cattle, horses, yaks and camels. These extremely friendly people will surely offer a swap ride on their horses for your bikes. Combine of the physical challenge of cycling with the ability to get to places and destinations that are just not possible using vehicles, and at a pace which truly gives you an insight into a people, their culture, history and traditions. Each route is carefully designed to recognize and encourage the varying skills and interests of the riders as well as to feel the real adventure. A bilingual skilled cycle-guide would always be there with you for the support on the trips and if required a four wheel jeep is also arranged along with wherever possible! Let your thrill rise with us!